One of the dangers a medieval traveller might face when crossing through mountainous terrain is the threat of avalanches. In his paper, ‘Travellers, Miners and Alpine Settlers: Dealing with the Risk of Avalanches in the High and Late Middle Ages’, Christian Rohr looks at what medieval sources had to say about avalanches and what methods were used to cope with them. The paper was given at the 2015 International Medieval Congress at the University of Leeds, during a session on Cultural and Social-Economic Responses to Extreme Weather and Weather-Related Natural Hazards in the Middle Ages. Rohr, a professor of environmental and climate history at the University of Bern in Switzerland, noted that there are hardly any records from this period that deal with avalanches, because there were few settlements in terrain mountainous enough for this to be a risk. However, the Alps, which stretched from France through Switzerland and onto Austria, had to be crossed by many medieval travellers, including pilgrims heading from northern Europe to Rome. 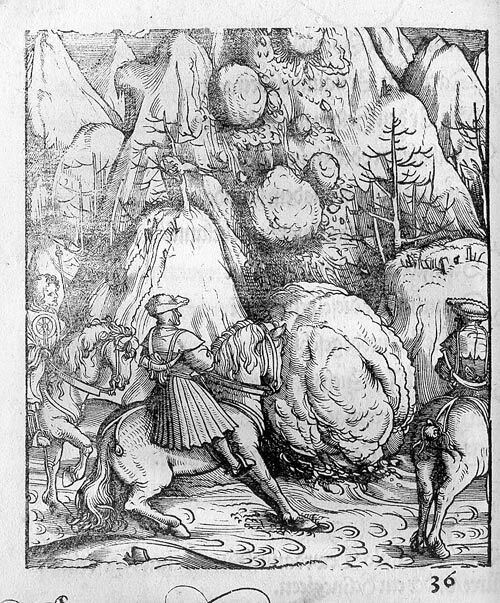 Rohr notes that detailed reports on Alpine crossings are very rare for the time before the fifteenth century. He reasons that the journeys were very difficult and people did not wish to talk about their unpleasant travels. Miners working in the high Alpine mining districts were also affected as were some settlements areas. After several days a very difficult path was pointed out to them by the marones who acted as guides (for those who point out the way are called marones) by which, after having traversed a distance of two German miles, they reached the village of St.Remy on the mount of Jove itself. Here, as though fixed in the jaws of death, they remained in peril of death by night and day. The small village was overcrowded by the throng of pilgrims. From lofty and rugged heights above it fell often huge masses of snow, carrying away everything they encountered, so that when some parties of guests had found their places and others were still waiting near the houses, these masses swept away the latter and suffocated some, whilst crushing and crippling others of those in the buildings. In such a continual state of death they had to spend several days in this ill-omened village. Then the marones of the mountains came of their own accord to the pilgrims and offered for a large reward that they should try to open up the road…Hence the marones wrapped their heads round with felt because of the extreme cold, put rough mittens on their hands, pulled on their high boots, the sole of which were armed with iron spikes on account of the slipperiness of the ice, took in their hands long poles to sound for the path buried under the snow, and boldly started along the usual road. When these devotions were taking place with the utmost fervency in church, a most sorrowful lament sounded through the village, for as the marones were advancing out of the village, for as the marones were advancing out of the village in one another’s steps, an enormous mass of snow like a mountain slipped from the rocks and carried them away, as it seemed to the depths of Hell. Those who had become aware of the mysterious disaster had made a hasty and furious dash down to murderous spot, and, having dug out the marones, were carrying back some of them quite lifeless, and others half-dead, upon poles, and dragging others with broken limbs in their arms…When the poor pilgrims came out of the church they were terrified by this horrible accident, hesitated a little while, and then fled back to Restopolis as fast as they could. Finally, Rohr points out that some pieces of information dealing with risk management against avalanches exist from the Middle Ages, such as charter from 1397, which puts restrictions against cutting down the forest of Andermatt. The charter also talks about protective buildings for settlements and mining districts, known as Ebenhöch. You can learn more Professor Christian Rohr from his webpage at the University of Bern.